They say it is mostly gone, the devastation indescribable. Joplin. The "city" near us. Its shopping malls, theaters and restaurants lure people from the surrounding area. Its hospitals care for our most critically ill.
Tonight the photos show a city in bits and splinters. People walk among the ruins like zombies, in a state of shock. The backdrop - one of the major hospitals which took a direct hit. The silence of my small town some 40 miles away is broken by ambulances and police vehicles which rush by my house to help in the rescue efforts. I suppose you have to be from the mid-west to understand, but there is a lure to the weather that creates these murderous phenomena. This evening I got a call; "We're under a tornado warning. Take cover." I'm not one for watching tv or listening to the radio, so I depend on friends to let me know what is happening sometimes. I looked down the street. The skies above me were bright, but to the north it was black as night. People along the street were standing in their yards, looking towards the skies. 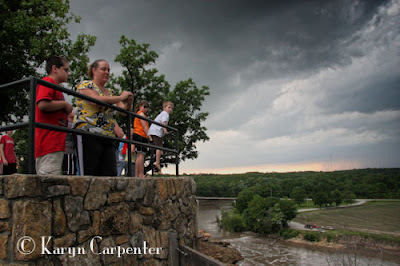 I grabbed Arayo and my camera and headed to the park which sits on a bluff overlooking the Neosho River and the farmlands beyond. The thought crossed my mind that the winds could blow down a tree or power line, trapping me alone, away from shelter. But, the winds, the boiling black clouds and changing temperatures were luring me for a better look. The scene on the bluff was a surprise. Cars jockeyed for a place to park, the elevated overlook was jammed. Parents, kids, dogs. 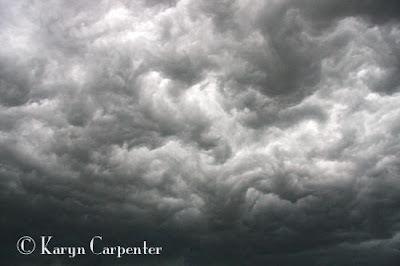 Everyone's eyes were scanning the clouds, searching for the dip that signaled the beginning of a twister. After a bit, the crowd began to clear. We Americans look for immediate gratification and watching the skies for hours was wearing thin. Three of us and a little white dog remained to watch the clouds which seemed angrier, and who's movement was making radical shifts. Usually, such warnings are fairly meaningless. "Conditions are right……. " "A funnel cloud was sighted……." "Go into a basement or interior room in your home….."
I've lived in the mid-west more than half my life and I've yet to see a tornado. My mother died at 86. Never saw a twister. I love tornado season. There's a charge in the air, an energy and power that seduces you….. Until you live through one, that is. Tonight Joplin lies in ruins. I worry for a nephew and friend who live there. I feel for all those dealing with loss, and worried for their loved ones. At least 30 are confirmed dead. The actual number may be much higher. Hundreds are homeless. Pleas are out for anyone with a medical background to respond………. Prayers and tears go out for all those affected. We had several here in Wisconsin this weekend as well. Personally I have experienced a few, mainly from a place of shelter. I've seen the destruction take one home and skip the next door neighbor. It seems as if the storms are becoming greedier, more violent in temper. They are saying that part of why this one was so deadly and destructive is that this one hit the ground and stayed there rather than jumping up and down. They are now reporting 116 dead. Very very sad. First, so happy to see you and Arayo are well...and I can see from the beauty of that photo you have posted 2nd on your Blog the true lure of the storms...I found myself drawn in by it's beauty..spectacular!